Eastern Wyoming College would like to announce the recognition of the individuals who were nominated by their peers for the Wyoming Association of Community College Trustees Awards. The nominations were for exemplary student, faculty member, non-faculty employee, and board of trustees’ member. Nomination packets included examples of how the nominee has had a positive impact on their community college and how they have been involved in the community. The EWC nominee for student of the year was Jenita Qualm from Erickson, NE. Qualm is a member of the EWC rodeo team, student senate and is active in a number of campus organizations. In her nomination packet, she was recognized as an excellent role model who faces challenges with a positive attitude and integrity. Nominees were recently recognized at the WACCT Community College Conference and legislative reception held in Cheyenne. 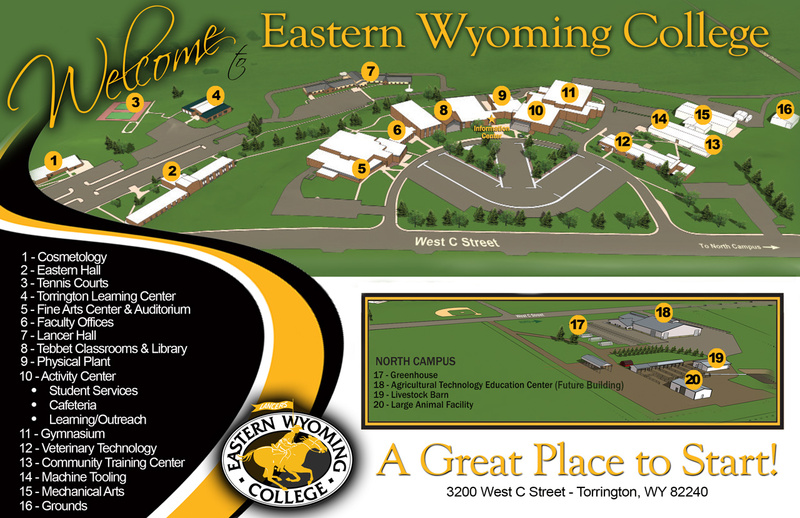 Eastern Wyoming College is pleased to announce the honor rolls for the Fall 2009 semester. There were 261 students receiving recognition for achieving high scholastic grades. The President’s Honor Roll recognizes students that are full time (12 or more credit hours) and achieve a 4.0 grade point average. To qualify for the Dean’s Honor Roll, students must also be full time and achieve a grade point average of 3.5, but less than 4.0. The Associate Dean’s Honor Roll recognizes those students who have at least six credit hours but not more than twelve with a grade point average of 3.5 or higher. The University of Wyoming Symphony Orchestra, directed by Michael Griffith will be performing at Eastern Wyoming College on February 28, 2010 at 3 pm in the EWC Fine Arts Auditorium. The University of Wyoming Symphony Orchestra is an 85-member ensemble playing the finest in orchestral repertoire. With soloists ranging from internationally known guest artists to faculty performers to student competition winners, and with tours throughout the Rocky Mountain region, The University of Wyoming Symphony Orchestra performs many exciting concerts each year. Admission for this performance is adults $15, students $7, and children 11and under are $5. For more information please contact the Community Education office at 307.532.8213. The Eastern Wyoming College Workforce Development and Construction Technology programs have been awarded a $79,275 Workforce Development Council and Department of Workforce Services Alternative and Renewable Energy Training grant. These monies will bring weatherization, small wind turbine technology, solar thermal, and photovoltaic training to employees and energy consumers. The project will provide training options for skills to develop and install green energy conservation technology components in residences, businesses, on farms and ranches and in municipalities. Courses, which will range from two to six weeks in duration, will result in industry recognized certificates. Class work will provide a background in energy conservation principles as applied in green building and weatherization methods, as well as tools to reach consumers. Those completing the diverse coursework will be valuable employees for businesses that service small wind turbines and solar energy, provide weatherization services, and for municipalities. Trainees will be able to utilize their skills to, ultimately, result in savings on energy bills for residents and businesses, and to conserve energy resources. Municipal employees will learn how to harness wind and solar energy to enable their towns to conserve energy. Curricula will be developed by EWC instructors and will include components set forth by the National Home Builders Association, Building Performance Institute (BPI), and ENERGY STAR’s RESNET, particularly as they relate to air loss and ventilation control. The EWC Workforce Development office will set up sites and training schedules across the region, and develop classes as requested by businesses, municipalities and other entities. The lab is expected to begin serving the area this year. The Office of Development at Eastern Wyoming College is looking for distinguished graduates who have achieved outstanding personal or professional success to receive the Distinguished Alumni Award. To obtain a nomination form or more information please call the Office of Development at 307.532.8397 or visit our Web site at ewc.wy.edu. Nominations must be received by February 15, 2010.